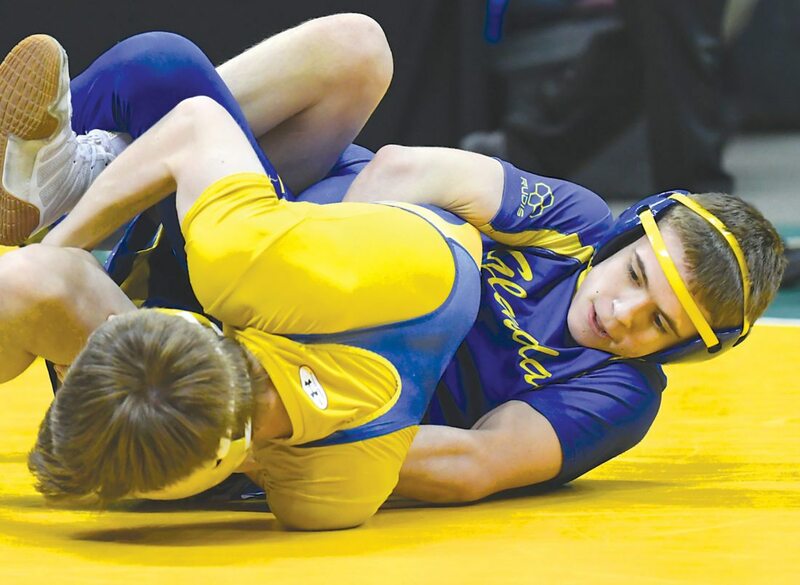 Photo for the Mirror by Tami Knopsnyder Glendale’s Brock McMillen (right) wrestles Chestnut Ridge’s Nathan Holder-baum. McMillen won by fall in 3:54 on Friday at IUP. INDIANA — Chestnut Ridge rolled through the preliminary round of the first day of the Southwest Regional Class 2A Tournament, going 10-3 and getting bonus points in all but one of those wins. They looked like they might run away with the team title they’ve been looking for since winning it in 2015. And then the Lions had a rough night session. Ridge went 3-7 in the quarterfinals and 0-3 in the first round of consolations. Still, with all of their second-round struggles, the Lions are in first place in the team standings with 55 points, 11.5 points ahead of District 6 champion Saint Joseph’s Catholic Academy (43.5). 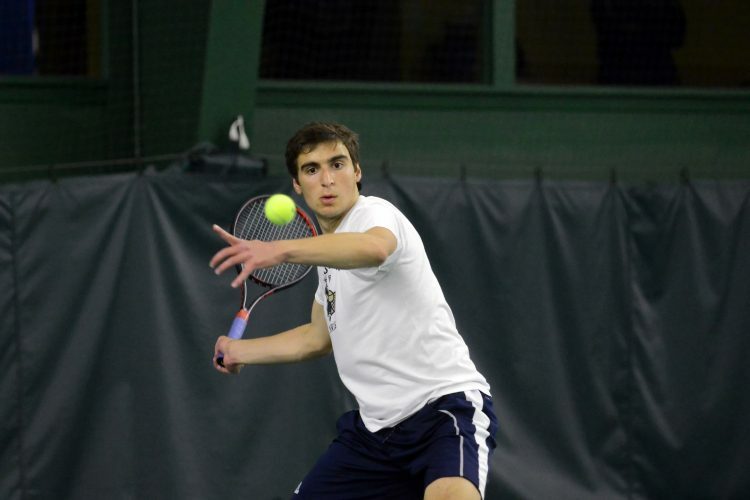 “We had a lot of close matches in that quarterfinal round, and we came out on the short end of every one of the close matches,” Ridge coach Greg Lazor said. “We didn’t have a good round. Ridge advanced returning state champ Justin McCoy (152), Jared McGill (160) and Austin Crouse (182), who combined for four pins and two major decisions. There are 13 area semifinalists, all of whom are assured of wrestling in the PIAA Championships in a couple weeks. Penn Cambria, which is tied with Freedom Area for sixth place in the team standings with 25 points, advanced three to the semis in Chase Proudfit (132), Jarred Stoy (160) and Derek Brown (170). Huntingdon, which is in ninth place with 23 points, advanced two in heartstopping style. Alex Mykut (195) trailed Summit Academy’s Tyler Stine, 7-5, when he threw Stine to his back and pinned him in 5:55. Landon Fisher (220) earned a 3-2 tiebreaker win over North Star’s Mason Augustine. Glendale’s Brock McMillen (113), Tussey Mountain’s Brady Villa (126), Central’s Braeden Swab (138), Portage’s Cole Sossong (160) and Central Cambria’s Nate Martin (285) also made it to the semifinals. Swab arguably pulled off the biggest win of the day as he beat Berlin Brothersvalley’s Tristan Pugh, 13-6. Pugh was ranked fifth by PA Power Wrestling, but he used his dominance on his feet to beat Pugh. “All glory to God,” an out-of-breath Swab said. “I had a pretty big first period. I wanted to get the score up because I know it’s hard to come back, so I got some good takedowns, got some points, took my time, stayed patient and did what I had to do. As far as I know, I’m going to states. Villa, the District 5 runner-up, is a surprise semifinalist. After pinning Burgettstown’s Austin Ryan in 3:25, he beat Glendale’s District 6 runner-up Tristan Rutter, 8-3. For his big day, Villa gets to wrestle Jefferson-Morgan’s three-time state champion Gavin Teasdale in the semis. The area 160-pounders had a good day. Of the eight wrestlers in the quarterfinals, six were from the Mirror coverage area. McGill beat Moshannon Valley’s Jon Dale, 13-4. Sossong, defeated Bedford’s Chance Dull, 6-0. Stoy was up 7-2 on Northern Bedford’s Tristin Guyer when Guyer had to injury default. Stoy was tied with Burrell’s District 7 champion Shaun Gates when he put Gates on his back late in the bout to win, 8-5. The 40-0 McGill will wrestle Sossong in the semis, while Stoy gets West Branch’s 34-0 Derek Yingling. Proudfit, who was a state qualifier as a freshman but didn’t qualify last season, made the semifinals with a 3-1 win over Ridge’s Cody Brown. He reached the quarters with a 4-2 win over Burrell’s Anthony Corrado. It was 1-1 in the third period when Proudfit scored a takedown at the edge of the mat with 45 seconds left. As Proudfit was riding Brown out in the final seconds, Niebauer was pumping his fist. Proudfit then ran up into the stands after leaving the mat. McMillen appears to be on another collision course with Mount Union’s Josh Boozel as he recorded two pins, including a fall in 3:54 over Ridge’s Nathan Holderbaum. McMillen (37-2) will wrestle Burrell’s Ian Oswalt in the semis. McCoy pinned Glendale’s Isaac Krause in 2:15 in the preliminaries, and then he earned a 12-2 major decision over Juniata’s Tyler Wileman. Crouse has two pins in his first two bouts. He decked Summit Academy’s Kyler Figuero in 1:54, and then he pinned Juniata’s Garrett Gabel in 4:30. Martin also has two pins, with the first coming in 3:32 over Laurel’s Mitch Miles and the second against Beth-Center’s Ronnie White in 3:37. Notes: The consolations are set for 10 a.m. Saturday, while the semifinals are at noon. The finals and third and fith-place bouts are at 5:30 p.m. … CementJob is live streaming all the mats at www.cementjob.com. 1. Chestnut Ridge 55; 2. Saint Joseph’s 43.5; 3. Mount Union 34.5; 4. Derry Area 33; 5. Burrell 29.5; 6. Penn Cambria and Freedom Area 25; 8. McGuffey 24; 9. Huntingdon 23; 10. Quaker Valley 22. 152–McCoy, CR, pinned Krause, G, 2:15; Wileman, J, dec. Komara, FA, 5-0; Christie, BURR, dec. Supanick, NS, 7-3; Law, FH, pinned Weinell, DA, 3:01; Todaro, MU, pinned Navarra, SSB, 2:12; Dohl, QV, pinned Fouse, NB, 5:37; Rothrock, SJ, pinned Hirt, SF, 2:56; Lawrence, FRA, pinned Holbay, WH, 2:56; 160–McGill, CR, pinned Allebach, PV, 1:15; Dale, MV, pinned Dedi, SF, :19; Sossong, P, pinned Gordon, CV, 1:05; Dull, B, dec. Tamburro, RIV, 12-6; Stoy, PC, dec. Gates, BURR, 8-5; T. Guyer, NB, pinned Muron, FA, 3:04; Heister, J, tech. fall West, A, 16-0, 3:19; Yingling, WB, tech. fall Lenhart, DA, 16-0, 4:31; 170–Patrick, LV, pinned Peroni, BE, 1:04; Walley, EC, dec. Mowry, NB, 10-5; Datz, SOUTH, dec. Marcozzi, BM, 3-1; Felker, PV, dec. Krause, M, 3-2; Hobson, CR, pinned Forsythe, QV, 1:44; Brown, PC, dec. Mele, BURR, 7-1; Henigin, BL, dec. Hutcherson, V, 7-6; Clutter, MCG, pinned George, U, 1:28; 182–Myers, WB, tech. fall Locke, SSB, 15-0, 3:26; Magin, QV, pinned Broadwater, M, 5:31; Shingle, MCG, dec. Kocik, H, 6-4 OT; Sheeler, NS, maj. dec. Neil, SH, 8-0; Crouse, CR, pinned Figuero, SA, 1:54; Gabel, J, dec. Feroce, BURR, 4-2; Gett, MC, maj. dec. Hersey, FA, 9-0; Vargo, BENT, pinned Helfrick, MU, 3:14; 195–Tremain, NS, pinned Wagner, R, 1:05; Miller, U, dec. Charlesworth, MP, 7-1; Mykut, H, pinned Barbella, AVON, :47; Stine, SA, dec. Lemin, TM, 7-0; Miller, FA, dec. Barber, JO, 3-1 OT; Knisely, CR, pinned Baker, BC, 3:45; Lough, MCG, dec. Dudurich, G, 3-1; Hockenberry, MU, pinned Walker, SF, 1:50; 220–Walters, BM, pinned Fadeley, QV, 1:48; Lopez, BENT, pinned Maxwell, CR, 3:47; Main, WG, dec. Elgin, FH, 8-3; Johnson, G, pinned Knotts, M, 2:39; Augustine, NS, pinned Weber, W, 1:54; Fisher, H, maj. dec. Mauro, SOUTH, 12-0; Ryan, MU, maj. dec. Kemper, BURG, 14-1; DeLuca, DA, dec. Croft, CC, 7-0; 285–Jones, BM, pinned Caragein, KO, 4:55; Vokes, MP, pinned Burkett, HFH, 1:59; Schuffert, V, dec. Winfield, SH, 6-1; Reed, H, dec. K. Guyer, NB, 12-6; White, BC, pinned Seace, CR, 3;24; Martin, CC, pinned Miles, L, 3:32; Franklin, SF, dec. Haselrig, JO, 3-1 OT; McCoy, SSB, maj. dec. Shaw, WB, 21-8. 152–McCoy, CR, maj. dec. WIleman, J, 12-2; Christie, BURR, dec. Law, FH, 3-2; Todaro, MU, pinned Dohl, QV, 2:34; Lawrence, FRA, pinned Rothrock, SJ, 5:45; 160–McGill, CR, maj. dec. Dale, MV, 13-4; Sossong, P, dec. Dull, B, 6-0; Stoy, PC, won by injury default over T. Guyer, NB; Yingling, WB, dec. Heister, J, 3-1; 170–Patrick, LV, tech. fall Walley, EC, 17-2, 3:34; Datz, SOUTH, dec. Felker, PV, 7-2; Brown, PC, dec. Hobson, CR, 5-0; Clutter, MCG, dec. Henigin, BL, 9-5; 182–Myers, WB, dec. Magin, QV, 7-4; Shingle, MCG, dec. Sheeler, NS, 1-0; Crouse, CR, pinned Gabel, J, 4:30; Vargo, BENT, dec. Gett, MC, 10-6; 195–Tremain, NS, dec. Miller, U, 10-3; Mykut, H, pinned Stine, SA, 5:55; Miller, FA, dec. Knisely, CR, 3-0; Hockenberry, MU, dec. Lough, MCG, 3-2 TB; 220–Walters, BM, maj. dec. Lopez, BENT, 15-3; Main, WG, dec. Johnston, G, 7-0; Fisher, H, dec. Augustine, NS, 3-2 TB; DeLuca, DA, pinned Ryan, MU, 2:42; 285–Jones, BM, dec. Vokes, MP, 3-2; Schuffert, V, pinned Reed, H, 1:25; Martin, CC, pinned White, BC, 3:37; McCoy, SSB, dec. Franklin, SF, 5-3. (For complete results, go to arena.flowrestling.org).